Welcome to the Back to the Future II Section. 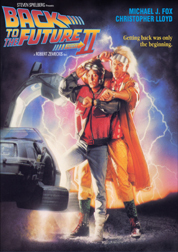 Here you will find the script for Back to the Future II divided into 20 pages based on their scenes. They include pictures and interesting facts about the film. You will also find screencaps from every deleted scene from the movie, as well as some information about the DVDs. You can access these by using the Navigation Bar on the right. Marty and Doc have barely recovered from their first time-travelling adventure when they launch themselves once more into the space-time continuum. But this time around, their attempt to fine tune the future in the year 2015 creates an outlandish, alternate 1985 Hill Valley where Biff Tannen is rich powerful and...Marty's Dad! Now their only cahnce to fix the present is by going back to 1955 all over again. 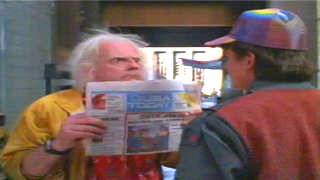 But can Doc and Marty patch up the past without igniting a universe shredding time-paradox? Power up the Trusty DeLorean and find out - as film-makes Steven Speilberg and Robert Zemeckis rev up another round of woundrously inventive, comically supercharged action in Back to the Future 2. The actress that plays Jennifer is the second film is Elizabeth Shue, the actress from the original Back to the future is Claudia Wells, Wells could not be in this movie for personal reasons. 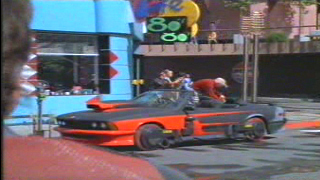 The license on Marty's Truck is 2BAK860, in the first film he doesnt actually hit the truck with his hand, or maybe he does but you don't hear it. 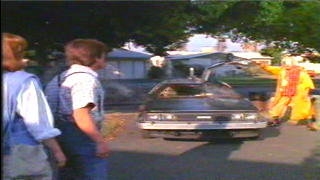 In the first film when Doc exits the Delorean he pauses for a second but in this film he gets right out. Also, when Marty asks if he and Jennifer become as*holes in the future, in the first film Doc says quickly "No, No, No Marty...", but in the second film he has to think about it. 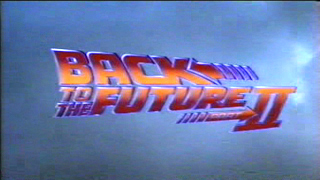 This scene was completely redone four years later for the closing scene of the first film, only a few frames from the first film were used, including close-ups of Christopher Lloyd. 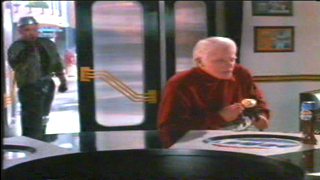 Mr. Fusion is made of a Krups Coffina Grinder; I've seen both the white and orange model, they're could be other colors. If you can find one they go for a pretty penny today on eBay. 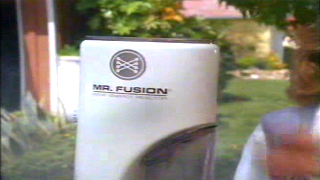 What the base of Mr. Fusion is is still unknown to this date. 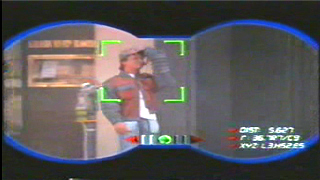 If you know what it is report to BTTF.com's message board and inform us. 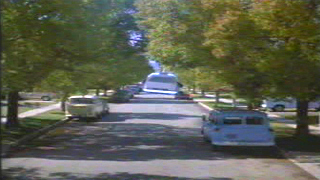 In this scene Biff discovers the flying DeLorean. I'm pretty sure it's in reference later in the film when Old Biff sees two Marty's and the DeLorean again. This scene was not in the first film. This opening scene was most suitable because it starts where the first film left off. 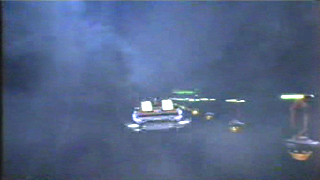 This is my favorite shot of the first movie where the DeLorean flies towards the screen, it's a shame they cut out the "To Be continued..." in the first film. 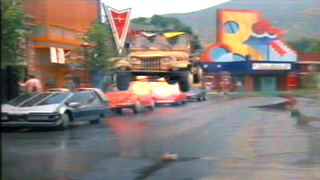 This opening scene was created for the Clint Eastwood movie Firefox. It was created by ILM. Crispin Glover is not present in the film because he asked for ridiculous amounts of money; he even asked for things that Michael wasnt getting. 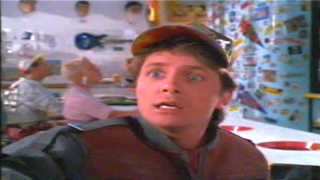 Marty and Jennifer learn in 1985 that they are going to the future with Doc, but they still act very surprised. 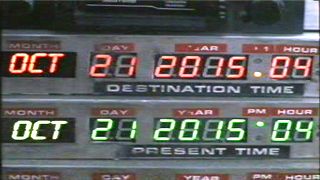 The time circuits read-out October 21, 2015 - huh, wasn't that the date that this website opened on? Doc uses an EZ-sleep Sleep Inducing Alpha Rhythm Generator, supposedly it sends a signal to you brain telling you to sleep, and since it didn't knock Marty Jr. out for a full hour it must only have a reserve amount of energy to work on. 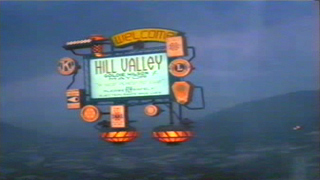 If you look on this part of the movie underneath the Welcome sign to Hill Valley you can see the Courthouse and the Clock Tower. 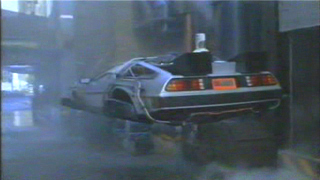 The Delorean is able to defy gravity as well as the time barrier. In the Future the weather must be precise for Doc to know when the rain will stop. Doc also says he wishes that the post office we as efficient as the weather service but later on Western Union keeps his letter for 70 year and delivers in on time. 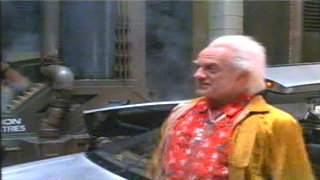 You can also see Fusion Industries behind Marty when he exits the DeLorean. I don't know if it was fusion that made that device or if it is Fusion's headquarters. Fusion Industries is the manufacturer of the DeLoreanss Mr. Fusion Home Energy Reactor. 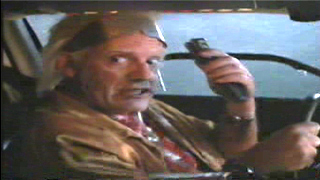 The Scene where Doc removes the old-age prosthetics was designed so that Christopher Lloyd wouldnt have to wear the wrinkle make up to make him look older, and it was funny. It was also created because Doc is going to be married to Clara in the third film, and he would be too old to see his children grow up if he had not gotten the rejuvenation. When Marty Jr. is walking down the street there is a building for women to go in and have Breast Implants put in. Marty goes to a phone to make a call; hopefully it isn't a prank call because it would be very difficult in the future with the advancements of videophones. The USA Today Doc gives Marty is titled Gang Jailed and costs $6. Other headlines of the newspaper include: Thumb Bandits Strike Again, Pitcher Suspended for Bionic Arm Use, Slamball Playoffs Begin, and Queen Diana will Visit Washington. Jennifer is put against the wall along with some cases of Laserdisc, CDs, and DVDs, also there is shredded paper, and silicone for Breast Implants. Someone has also spray-painted on the wall Class of 16. The Bionics in the future is a reference to Universals The Six Million Dollar Man and the Bionic Woman. Posters in the alley include Re-Elect Goldie Wilson JR, and Vote Yes on 237- Legalize Bionics. 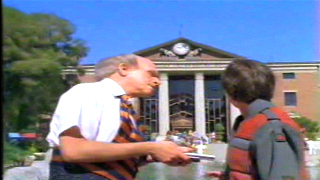 Hill Valley has also adapted to the future, and so is our world. The Courthouse has black windows and so do many of the cars. In today's world black windows are starting to replace tinted windows. 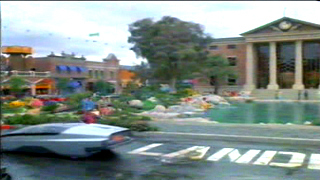 You can see that the 1985 parking lot has been replaced with a pond. You can also tell that the world is moving towards a cleaner environment, as is our world. Texaco is serving Havoline, and a machine checks you oil, landing gear. Underneath the Texaco you can see a full self-automated compuvend futuristic 7-Eleven, cool huh? Besides the original businesses 7 Eleven, Texaco, Pontiac, Pizza Hut, other businesses include Mr. Perfect All Natural Steroids, Hill Valley Surrogate Parenting Center, Uni-Globe Travel, Bottoms-Up A Plastic Surgery Franchise, and the Bot Shoppe. The 7 Eleven also offers maps and routes for local hoverbusses and express trams across Mid-Valley and downtown Hill Valley. Jaws 19 is playing at the Holomax theatre. 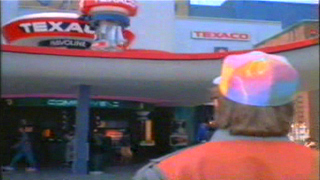 Contrary to what many believe this is not the theater that exists in 1985 and 1955, it can be seen in the Hoverboard chase scene in the background. 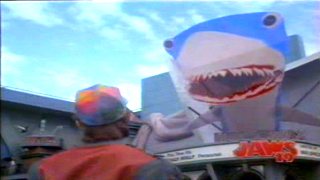 Jaws 19 is directed by Max Spielberg; Max is Steven Spielbergs Son. Looks like 3rd time isn't a charm, Goldie Wilson III has broken the chain of Mayor's in his family. 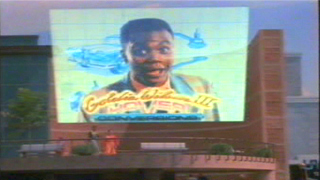 He owns Goldie Wilson's Hover Conversions, you can hover convert your old road car for only $39,999.95. The Mayor in the Future is Goldie Wilson III's Father. But how could Doc afford a hover conversion you ask? It is a theory that Doc sold the remaining plutonium when he installed Mr. Fusion. 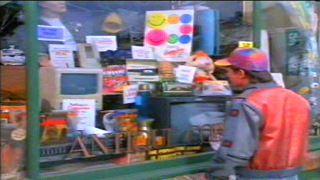 Several items appear in the Blast from the Past window, some include a Roger Rabbit doll, the infamous Gray's Sports Almanac, a Jaws video game, and Marty's jacket from BTTF1. Lous Café from the 50s is now the Café 80s. 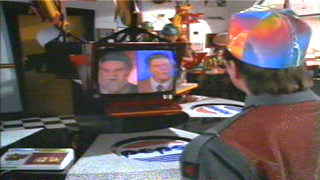 In the Cafe 80's virtual waiters take your order they are Reagan, the Ayatollah, and Michael Jackson, there is also a Pac-Man Arcade game with a sign saying Priceless Artifact - Do Not Touch. Also on one of the tables there is a Baby on Board sign for the late 80's. On the TV's Oprah, the Smurfs, Taxi, Family Ties, and Miami Vice and many others are playing. 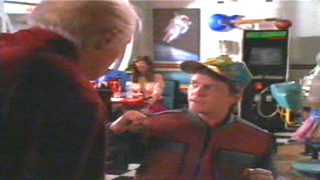 The Early Script for BTTF 2 says that the Café 80s was owned by Biff Tannen Jr. 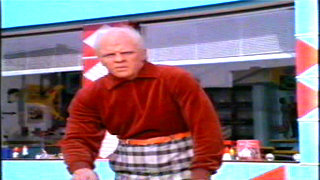 The inscription of Biffs Cane reveals his full name to be Biff H.Tannen. 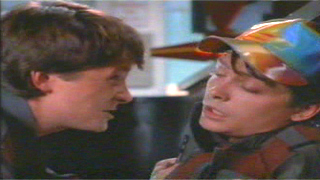 Biff tells Marty that he becomes a loser. Griff comes in to get Biff to finish the job on his car. According to the USA Today article it confirms Griff's Last name as Tannen. Biff is still pulling the same games he did in the past, trying to charge people for two coats of wax when he only applies one. I'm surprised that Marty was shocked to realize that he was Griff. Besides that he spent a week in 1955 with someone who looks just like him. I'm guessing since the two boys in the cafe werent' impressed with Marty's crackshot that they have more exciting games to play - such as virtual reality. 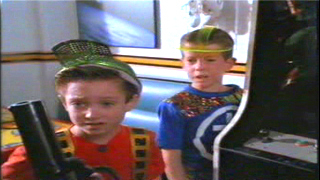 The boy on the left is Elijah Wood making his film debut. Marty Jr. is wearing a white shirt with a logo that many people wear with the plus and minus sign on it. Griff throws Marty into the TV and then the past Marty takes over. The original line for this scene was "Yuppin' lookin punk", I think that would have sounded better than "All right Punk". The Car that Griff owns is a BMW Convertible 6.3.3 CSi. 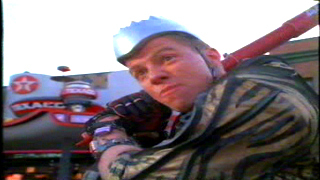 Bob Zemeckis has said it before that Hoverboards are NOT Real. They say that Mattel was so pissed off at them for all the mail they got from kids who wanted the Hoverboards. 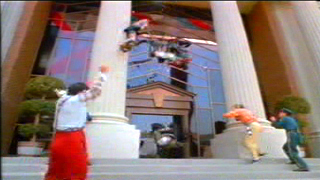 The Hoverboard scene was done with harnesses on the actors. In the Early Script Marty is chased onto a Slamball court where his Nike grip shoes allow him to run up the curved walls to get away. This is the theater from 1955 and 1985, it still exists in the future, but there is a Holomax down the street. 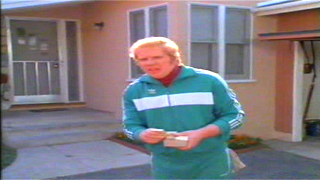 "There's something very familiar about this", Biff reminisces on the skateboard chase in 1955. Biff's bat is a Kirk Gibson Jr. Bat; Gibson played for the Dodgers and hit a home run to win the World Series. Very few remember him today. The Courthouse mall entrance is destroyed but is repaired very quickly over the next 4 days. Also replaced is the clock, poor Terry. When Griff's Gang crashes into the courthouse you can see the character Spike hit the pillar, she was injured very badly, the stunt person was Cheryl Weeler Dickson. A Sign by the Pond says No Hoverboarding, which is one of the charges that Griffs Gang will be charged for. 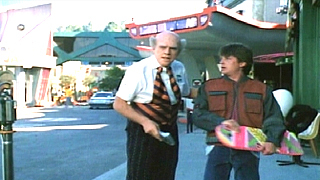 60 years later the concrete ledge that Doc slipped on in BTTF1 is still broken. The man who asks Marty for money to help save the clock tower is Terry he is played my Charles Fleischer, he is the man who did the voice of Roger Rabbit. Terry: Lightning struck that thing, 60 years ago, [Marty: Yeah, I know] November 12, 1955; I always remember that day do you know why? Because this old buzzard tried to shaft me outta 300 bucks for fixing his car! Biff: Oh, Shut Up Terry! Terry: The Car was filled with manure Biff, manure. I am a mechanic, Im not some kind of stable boy. 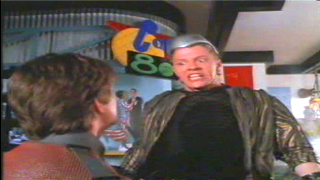 Biff: Ah, youre livin in the past Terry. 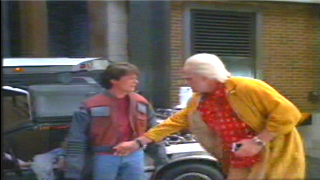 This longer version of the Terry scene was to establish the relationship between Terry and Biff that pays off in 1955 and also Terry mention the exact date that Old Biff is going to go back to, so the idea was what inspired Biff to pick that date to go back in time when he steals the DeLorean.